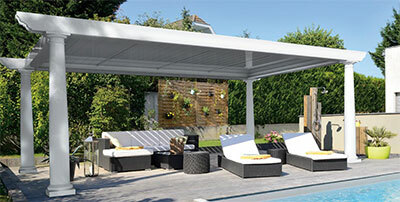 Aluminum pergola with rotating louvers, providing protection against rain and sun. For a pleasant respite in a resort-like venue, build this lovely, freestanding structure to provide some shade from the hot sun. 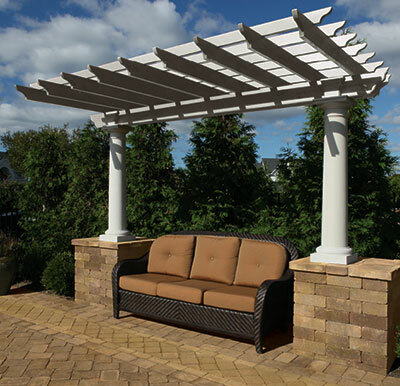 A custom pergola with pre-packaged convenience! 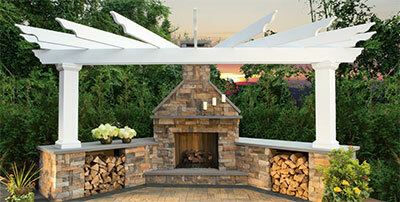 You can custom order the length you need up to 20 ft. for virtually any application. 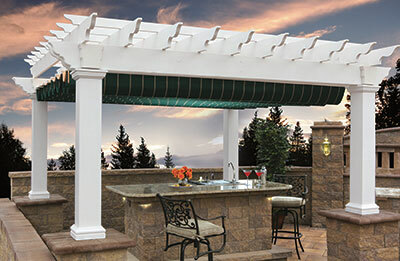 *For extra shelter from the sun and rain, add an easy to connect, optional overhead canopy to your 4 Column Pergola Kit with durable, extruded aluminum parts (excludes purlins as shown in photograph), which includes a WeatherGuard rain layer. A choice of stylish fabrics, green or red with beige stripes and Roman pleats, carries one of the best fabric warranties in the industry!